Alligator Preserves is a narrative podcast for readers, writers, and storytellers with a new topic each week capturing the humor in mundane moments and the poignancy of moments more memorable. McHargue will challenge listeners to engage with their lives more fully and to open themselves to new experiences--enriching their own life stories as they do--and will intermittently interview guests with memorable life experiences. If I interview you, be ready to brainstorm at some point in our conversation! When a friend asked author Laurel McHargue what her new publishing goals were for 2018, she considered her options and decided to expand her author platform in a way that would engage listeners as well as readers. "I listen to several different podcasts while driving or doing mindless activities, and I really enjoy them. There have been times this past year when I've thought, I could do that," said McHargue. 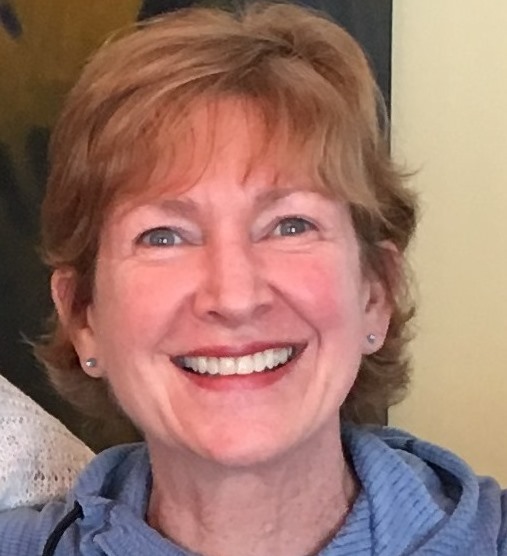 With technical support from her husband, Mike, and narrating support from her son Nick, she was able to launch her podcast successfully. "After recording my own intro and outro for my first episode, I asked Nick if he would consider letting me record him. I think you'll agree I made a good decision. He has a wonderfully resonant voice." After listening to Nick's voice on air, McHargue said she hopes her son will narrate her novel The Hare, Raising Truth, because she knows "he could do a great Rod Serling voice. He said he just might do it." Alligator Preserves is a weekly podcast for people who enjoy storytelling, story reading and story writing, "but probably not story ‘rithmetic, because that’s not a thing." McHargue will examine a new topic each week with an eye toward capturing "the humor in mundane moments and the poignancy of moments more memorable." By exploring the human condition with a magnifying glass, she strives to find common ground on a planet shaken by uncertainty. 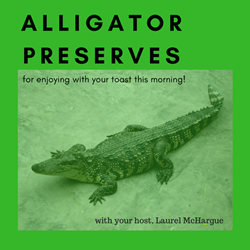 How did McHargue come up with the title Alligator Preserves for her podcast? "You'll have to listen to Episode 1, entitled 'Balls,' to understand the genesis," she said. Using stories from her past and present, she will challenge listeners to engage with their lives more fully and to open themselves to new experiences, enriching their own life stories as they do. She will suggest reading, writing, and storytelling tips, and will intermittently interview guests with memorable life experiences. She will post her show notes with photos and links for each episode on her website. "And if I interview you, be ready to brainstorm at some point in our conversation," she added. "I like to start with one highly focused topic and see where it will lead us." 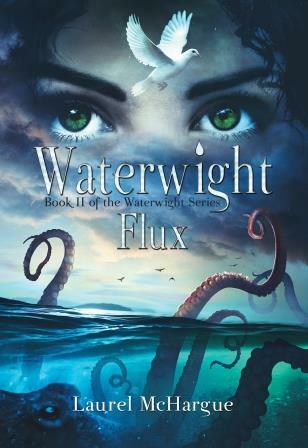 McHargue's new novel Waterwight Flux: Book II of the Waterwight Series is free on Kindle from Feb 1-5, 2018. Listen and subscribe to Alligator Preserves on iTunes, Stitcher, or wherever you enjoy listening. Laurel McHargue--Author, blogger, podcaster Waterwight Flux: Book IICeleste thought she was finally on her way home, but ancient gods Odin and Kumugwe have other plans. Free on Kindle Feb 1-5, 2018.